Mainers who were in the French capital Monday reflect on seeing the fire that destroyed part of the historic Notre Dame Cathedral. Several Mainers vacationing in Paris this week were witnesses to the destruction of one of the city’s most iconic buildings when the Notre Dame Cathedral caught fire Monday, a loss that left them stunned. Among them were Amy and Andrew Page of North Yarmouth, as well as 22 students and chaperones from Portland’s Waynflete School. The Pages had gone to a restaurant Monday near the Seine River, about 100 yards from the cathedral, for what they thought would be a quiet evening out in Paris. Instead, they had what amounted to front-row seats to the spectacular fire that swept through the 850-year-old Catholic church. Built in the 13th century, the medieval structure is one of Paris’ most popular attractions, with about 13 million visitors a year. Amy Page said she and her husband, their 2-year-old daughter and her mother had just sat down at the Comme Chez Toi and were about to order dinner when they noticed wisps of smoke and eventually flames leaping from the historic structure. “When we went outside we could feel the heat from the flames,” Amy Page said in a telephone interview. “At first we thought the fire would be quickly contained, but that is not what happened,” said Page, who attended a Palm Sunday service a day earlier at the cathedral with her mother, Fran Barrett of Connecticut. Mother and daughter both love history and art. “We are all still pretty overwhelmed and shocked by what happened,” she said. The Pages, who work at Idexx in Westbrook, have visited Paris twice in the past eight months. They arrived in Paris last week so that Andrew could run in the Paris Marathon on Sunday. Nearly 50,000 people ran in the marathon. 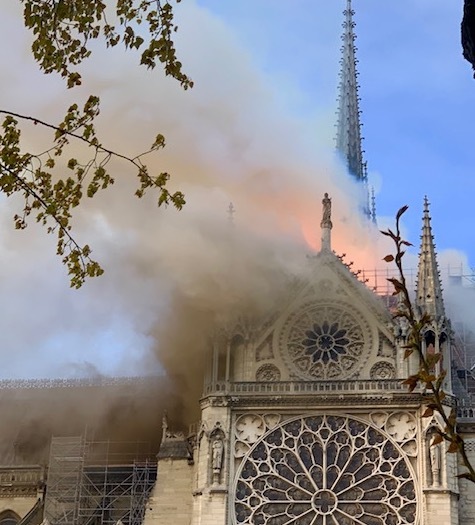 The teenagers from Portland’s Waynflete School had been in Paris for only a few hours and were mostly exhausted from their flight when they approached the at-the-time undamaged Notre Dame Cathedral early Monday afternoon, but were in awe when they first saw the church. The 22 students and chaperones tromped around outside as a tour guide explained its history and that of the island where it stands, and how for centuries the church and its massive Rose window have stood largely unmarred through wars and revolutions, surviving as an icon to all of France. A few of the kids made plans to tour the inside of the cathedral when they had free time later in the week. But when the group arrived at their hotel on the city’s outskirts a few hours later, it was already too late. Television showed what the horrified world was watching in real time: Flames leaped toward the peak of the cathedral’s central spire and raced across the pitched slate roof, curling through a lattice of scaffolding that had been erected to renovate parts of the gray stone facade. The column of smoke that rose into the evening was visible across the city. Kaplan, who has a Ph.D. in French literature and history from New York University, said the French will be in mourning for the death of one of their central monuments. She likened the disaster to when the Afghan government under the direction of the Taliban dynamited the Buddhas of Bamyan, some of the largest and oldest statue carvings of the deity, as the world watched helplessly. “That’s what the French people are feeling right now,” she said. Kaplan said the experience will surely color their trip, and their experience with the French people, who will be in mourning. She said she planned to take the group to the Champs-Élysées to show them damage caused by protesters with the Yellow Vest Movement, who demonstrated against rising costs of living and fuel prices at a time when France, like other nations, is experiencing unprecedented wealth disparities.